As the Hamlet! advertisement reveals, the actor or musical interlude or “crowded and brilliant” audience could be themselves the true selling points for a production, far over and above the entertainment value of a Shakespearean play-text itself. 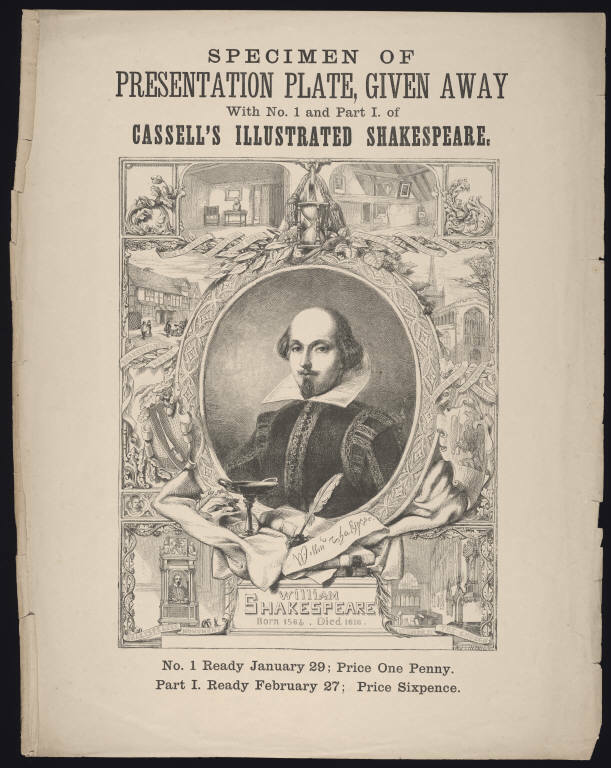 And this was true as well in print, as can be seen in this specimen plate for Cassell’s Illustrated Shakespeare, given away with the first number and first part of the edition: price one penny for the first number, available on January 19; price sixpence for the first part, ready on February 27. But the Shakespeare illustrated here is not that seen in Garrick’s Jubilee or Boydell’s Shakespeare Gallery. Instead of processions of characters, or illustrations of well-remembered scenes, we find instead the imagined spaces inhabited by Shakespeare, author, in his lifetime or after: Stratford upon Avon, alongside the house in which he was born and the memorial, which we have seen already from William Dugdale’s Antiquities of Warwickshire (1667). Shakespeare, wistful, wispily bearded in the center, peers out at his viewer above a signature almost as convincing as that forged by William Henry Ireland.